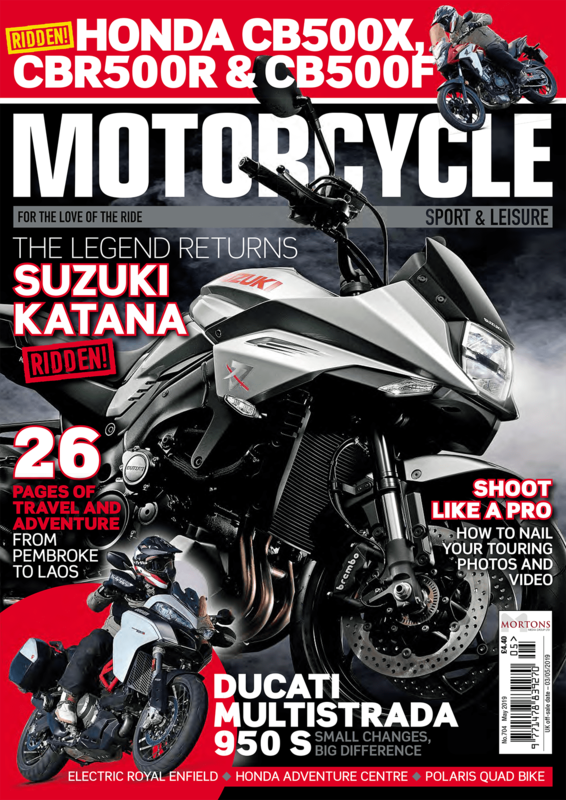 I’ve been riding since I owned a Yamaha FS1E at 16, and bought the Speed Triple – the first of the 1050 models – in March 2007 from Total Triumph in Taunton. I’d liked the look of all the Speed Triples since they launched, but when Triumph brought out the 1050 there was something about its short, chunky stance that really gripped me. And then Total Triumph let me ride one… I was convinced! They got this one in on part-exchange for a 1050 Tiger so I snapped it up – the optional tribal paint really made it stand out. Before buying this, I had a matt-black, un-faired 955i Sprint ST, which I still own along with a vintage Tricati – a small-frame 350 Ducati with a 350 Triumph motor in it. Including trips abroad (so some miles on hire bikes) I ride an average of about 8000 miles a year, and have put 30,000 miles on the Speed Triple since buying it, using it for year-round commuting, weekend trips and the obligatory Sunday blasts to the beautiful coasts we have down here in the South West. The longest trip I’ve done on it in a single day was around 300 miles – there were no real issues, even on the motorway; the fairing deflects more wind than most would think. I’ve never owned a faired bike, so have never been bothered by the talk of “wind blast over 80” that most reviewers complain of with naked bikes. The fuel range is roughly 160 miles at a push – depending on how you ride it – which is plenty for most people in a single stint. I took a pillion on it once, and while she was quite small, she still found the back uncomfortable. To be honest, I think the idea of a pillion was a long way from the designers’ minds when they built the Speed Triple. I love the smooth, constant wave of torque, and the fact that you can happily commute on it, pass your IAM test on it, or ride it hard and let its pit-bull side come through – the sound of the triple motor is incredibly addictive, and I think the handling is superb. Oh, and pretty much everywhere you go people will come and ask questions about it. 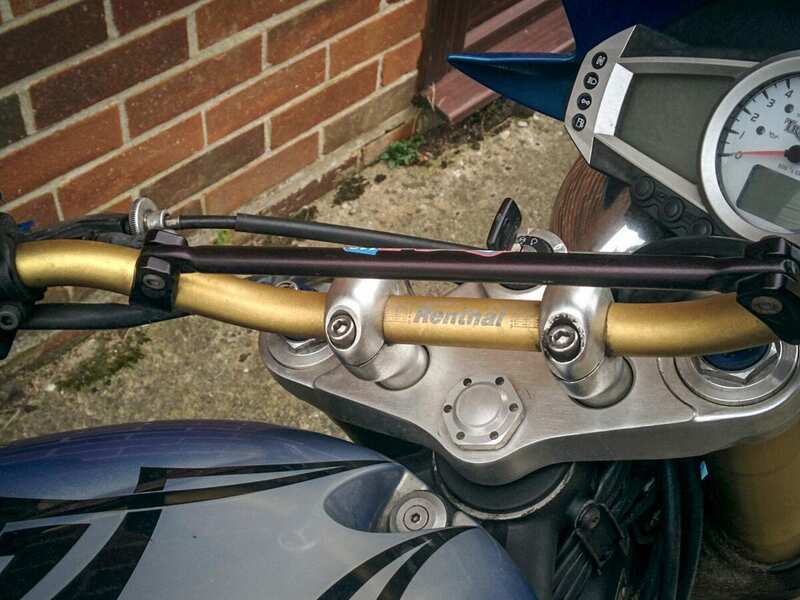 The handlebars had already been changed for Renthals when I bought it, and having ridden one with standard bars I do prefer these aftermarket ones. I fitted a tail-tidy to replace the pig-ugly standard rear, although now I have to be prepared to get a wet back when riding in the rain. The original under-seat exhausts were changed for carbon fibre M4 cans, which sound much better and shaved off almost 7kg. Because the standard cans were mounted high, the M4s made a huge improvement to the handling. I also fitted a K&N air filter to help the bike breath more easily. Having changed the exhausts, a big hole was left where the originals were, and the rear pegs looked odd, flaring out over them. 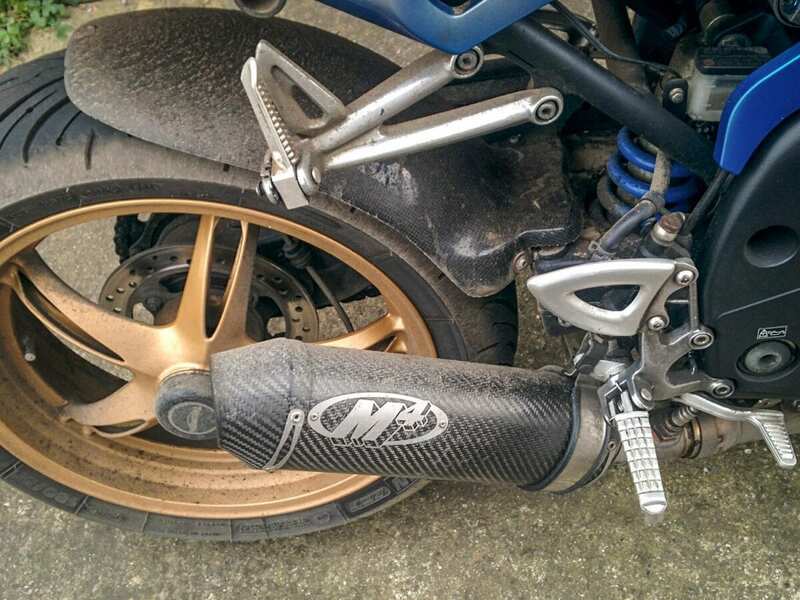 Daytona 675 ones fit directly on, and really tidy it up. The standard lights aren’t bad, but replacing the OEM bulbs for some Osram Night-breakers has made a big improvement in both use at night and how visible they are in daylight traffic. I’ve also bought a Ventura luggage rack, to make weekend (or longer) trips less hassle with luggage. Other than that, I wouldn’t mind an extra couple of litre’s capacity in the tank, and I wish there was more space under the seat. Oh, and it’s useless for luggage – for the newer models, companies are making luggage, but for the ’05-’07s there’s little to none. 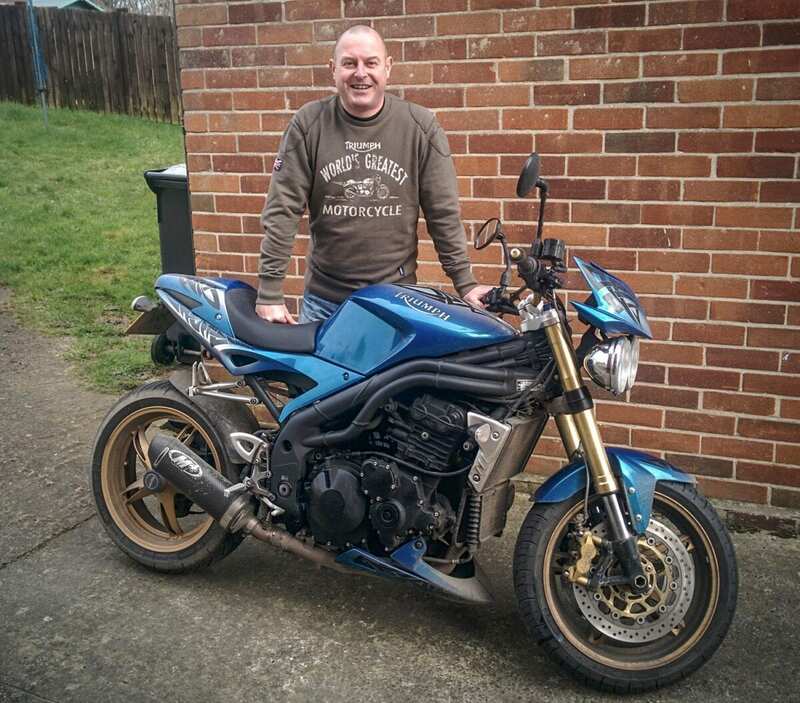 I have no plans to change it – I always wanted a Speed Triple, and so although I’ve ridden new models of the 1050 they almost seem a little ‘too good’ – they don’t seem to have the same character to me. I think other bikes may come and go from the garage, but this will stay. Having said all that, if I did need to replace it, it probably would be with a newer 1050, but one before ABS / traction control. I don’t see the need for such rider aids on the road, and to me they’re just one more thing that can go wrong. Though now I’m thinking about it, the new Street Twin does have some appeal, and I love the Indian Scout (but have far too many Triumph T-shirts to change brands). To me the Speed Triple is the true spiritual heir to the original Bonneville in the Triumph range. The first Bonnie was a small, sporty performance bike that made other manufacturers change their game, and I think the Speed Triple did the same in resurrecting naked roadsters. Nobody else was making one and now everyone does. It may not be the most powerful, but on the road it’ll hold its own against any of the others. 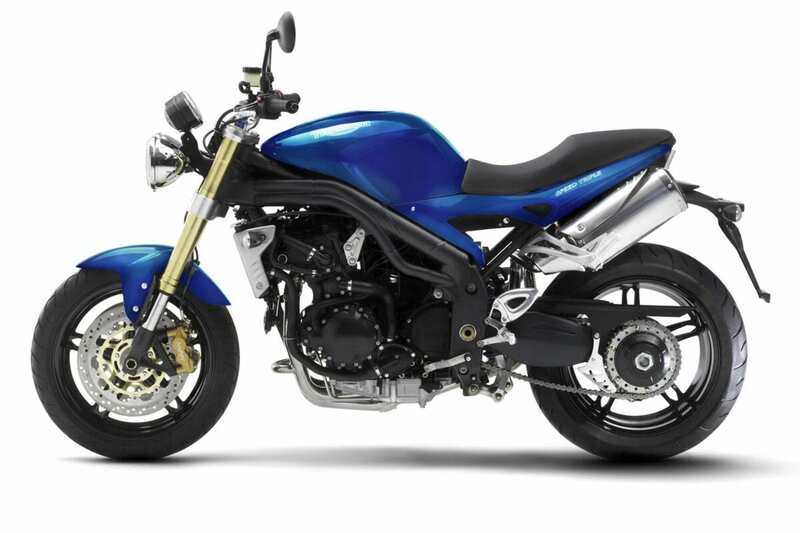 Very few bikes deserve the title ‘iconic’, but I believe the Speed Triple is one that does… and it’s British! General impressions: Great fun, stonking motor, never fails to put a smile on my face. A true British hooligan – in a good way.